What is a sable? A sable is a french butter cookie. The name "sable" comes from the french word sand, which refers to the almost sand like (crumbly) texture of the cookie. 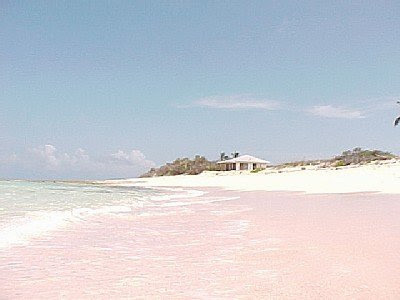 Did you know there is an actual pink sand beach in Cape Sable, Everglades? Book me a ticket, please! A few weeks ago my girls and I visited family in Montana for a few days. My sisters and I decided to have a kid-free night at the Ranch Club Restaurant. What a treat! For an appetizer they brought out the most decadent cheese board. Being from sunny Southern California wine country I've eaten A LOT of cheese (paired with wine of course!) and this would have to be one of the best cheese boards I've had. This is my version of their graham cracker sable paired with taleggio and raspberry sauce; it was fantastic and the perfect 'finger food' appetizer. Preheat the oven to 350 degrees. Place 2 pieces of parchment on 2 baking sheets. In the bowl of a standing mixer on med-low setting, combine graham powder, flour, salt and brown sugar until well incorporated. Set the mixture speed to low and pour the butter into the graham cracker mixture, mixing well. Add the egg, one at a time, beating well after each addition. Wrap the dough in plastic wrap and place in the fridge for up to 1 hour. Place plastic wrap on a flat surface, lightly flour the wrap. Put the dough on floured surface and roll out into 1/8-inch thick. 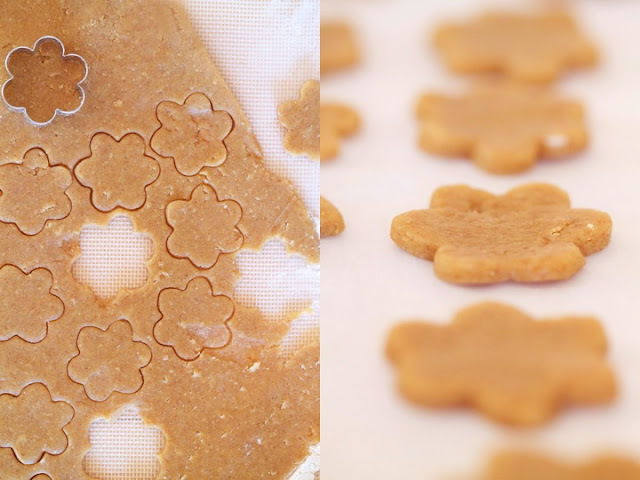 With 1-inch cookie cutter cut out graham dough and place on parchment paper. Bake for 8-10 minutes, or until golden brown. Let cool. Cut taleggio in 1/2-inch pieces. 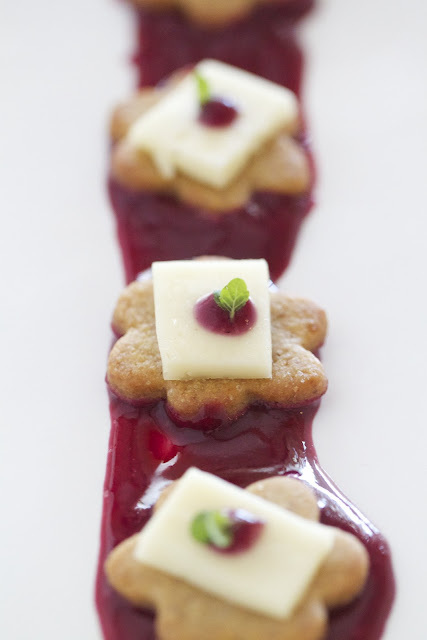 Spoon the raspberry sauce on a plate, top with graham cracker sable and taleggio. 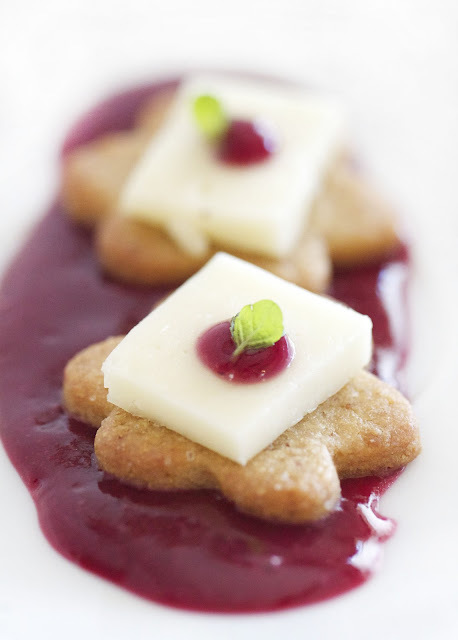 Dot taleggio with raspberry sauce and garnish with mint. These are beautiful, Katie. And my mouth is watering over that raspberry sauce. I love it! Happy new year! OMG. These are absolutely GORGEOUS!! Reminds me of our cheesecake with raspberry sauce, but this is just sooo much more elegant! Can't wait to try them out. 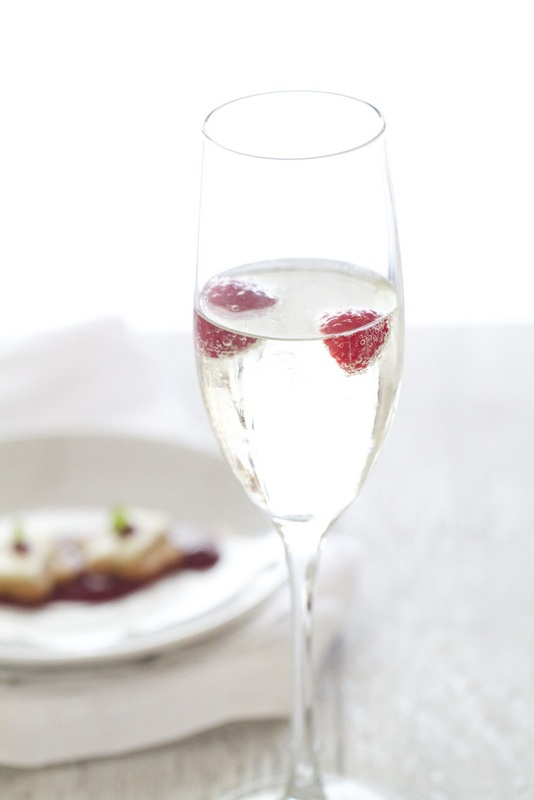 Happy New Year and thanks for sharing such a terrific recipe! I got the exact same cookie cutter. Maybe that's a sign. Lol. I'm just looking for an excuse to make these delicious delights soon! Happy New year! Wow Katie, your graham cracker sables look so amazingly beautiful!!!! I love the way you've presented them!!! Just gorgeous and so elegant. A pink sanded beach does sound heavenly :) These are just gorgeous, the combinations of textures and flavors is shear perfection! Along with the wonderful photos! Simply gorgeous! cant take my eyes off em.. ty for sharing and have a wonderful 2012! cheers! Fabulous recipe! I love serving a cheese board when entertaining and making appetizers like this. Beautiful! I love this idea for entertaining! Pink sand? Seriously? Okay here's the deal okay, if you or I win the lottery we met up there and have a pink party together. Sound good? I have never tried anything like this recipe. It just looks so pretty. Would be wonderful at a dinner party.